Arlene Santiago after removing both her Breasts from Cancer. If you were to meet Arlene, the first thing that you would notice is her energy. It’s impossible to ignore how positive she is; it seems to practically radiate from within her. It seems appropriate then, that her middle name is ‘Crystal’. But what you wouldn’t notice is the many times that Arlene’s body has been ravaged by cancer. Arlene has battled cancer not once or twice, but four times. And despite this, she continues to smile. She has lost both her breasts, struggles with her mobility, and has limited flexibility and strength in one of her shoulders. She’s also one of the most unassuming superheroes you’ll ever meet. Each day Arlene wakes up at 6:30 in the morning and gets ready for work. She drives from her home in the Bronx to New Jersey, where she works as a medical assistant. She works at her brother’s medical non-profit. “I’ve always been involved in the medical field – I have my licensing as an EKG technician, and I used to work as a phlebotomist,” she explained. She jokes that it’s the “perks of being the sister” that allow her to work part-time and have the flexibility to take the time she needs when she’s not feeling well. The after-effects of chemotherapy and a double mastectomy have taken their toll on Arlene, but despite her physical struggles, she says she tries to “just get on with her day” as best she can. For Arlene has work to do: helping the city’s homeless. Each week, Arlene dips into her personal funds to build hygiene kits for homeless people. “I live on a fixed income,” she says. “But I always want to take some money and buy things to build my packages.” And so, Arlene buys soaps and washcloths, wet wipes, toothpaste, cologne and perfume and builds her kits. For the women, she makes sure to include feminine products like tampons or sanitary napkins. And then, she climbs into her car and drives all around the city, from 11:30 at night to around 1:00 in the morning, going from neighborhood to neighborhood, distributing her kits. And that’s not all she hands out. “Yeah my car is always full of clothes,” she laughs. Like what you see? Discover what you can do. Be a Doer. Sign up for our newsletter! Friends and family give her clothes that she sorts and keeps in her car. And when she encounters someone who might need some, she lets them go through and pick out what they want. But the most important thing Arlene gives is someone for the city’s most overlooked people to talk to. Arlene believes that her struggles have only given her more empathy for others. She hopes that she can pass on this compassion to her children, who often join her for her nightly drives around the city. It was a homeless man that lived nearby that made sure Arlene always had something to eat. Most people focus on a homeless person’s dirty clothes, Arlene says. Or their smell. But she never notices. And even though Arlene has distributed hundreds, and even thousands, of kits over the last fifteen years she’s been doing this, she insists that she is the one who receives the most. When she’s not handing out hygiene kits and clothes to the homeless, Arlene is busy helping people who are battling cancer. It’s important to her, to give something to the people that are facing what she has had to face several times in the 47 years she’s been living. More than a third of adults will be diagnosed with cancer at some point during their lifetime. At the time she was constantly sick, and bleeding. Several years later during a routine gynecological exam, Arlene received more bad news: she was in the early stages of having cervical cancer. Thankfully, she says, they caught it in time. But then, when she was in her 30’s she was diagnosed with thyroid cancer. But her worst battle was at 38, when she was diagnosed with breast cancer. “I had to fight for my life,” she says. It took almost a year before doctors believed Arlene when she said she knew something was wrong with her breasts. She says they felt wrong. Heavy. “”I knew something was wrong,” she remembers. But the doctors disagreed. “They just thought that because I had cancer so many times, that I was just panicking over nothing,” she explains. But the problem was, her tests always came back negative. And mammogram after mammogram, they said they couldn’t find anything. They told Arlene that nothing was wrong, and referred her to a psychologist. But after noticing she was distraught, one nurse decided to indulge Arlene, and conducted an ultrasound of her breast. And there it was. A mass. Doctors thought it was just fluid and went to aspirate. But when they went to extract fluid, nothing came out. Arlene had a biopsy, and received the news she already knew, but didn’t want to hear: she had breast cancer. What’s more, she was already well into Stage 3. Doctors told her to get her affairs in order. With 34 of about 40 lymph nodes impacted, they said she wouldn’t make it past 4 years. That was almost 10 years ago. Since her fight with breast cancer, Arlene has been given a new lease on life. She started her own photography business, after going back to school to learn photography in 2014. Photos were always a passion, she says, but it was during her time at chemotherapy that she would stare at the pictures on the wall, imagining herself somewhere else. “I enrolled myself in a women’s photography club, and have had my photography displayed in different galleries,” she says, proudly. 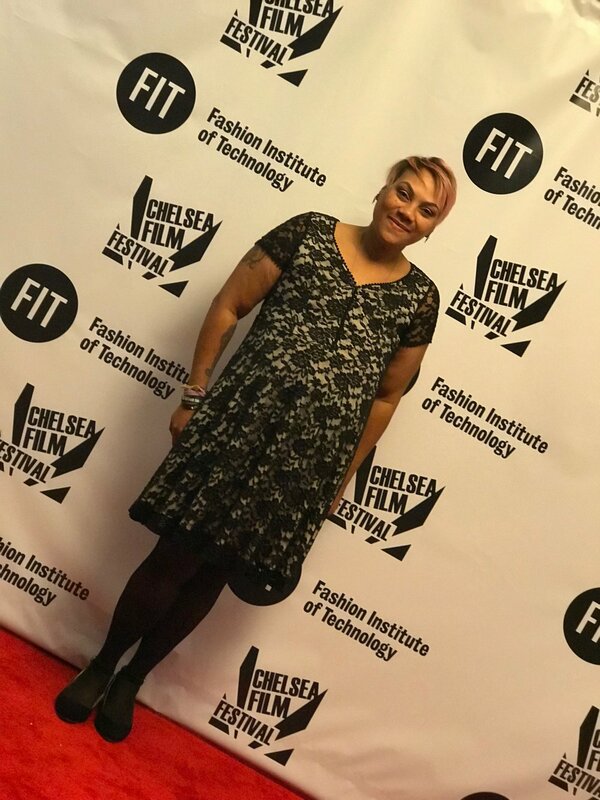 Arlene at the Chelsea Film Festival celebrating her passion for photography. But like everything she does, Arlene uses her skills to give back. Her photography has been used to raise money for the American Cancer Society and the money she gets from clients goes towards making her kits. And Arlene couldn’t imagine it any other way. Support Arlene as she helps those battling with cancer. Contribute to her campaign today. Up next in our Beauty Marks series, we're talking with some of the top fashion and lifestyle bloggers today as they get up close and personal with their own struggles with body image in a world of picture perfection. Do you have a Beauty Marks story? We'd love to hear from you. Leave a note in the comments below. Kristin is an award-winning journalist, producer, and communications specialist that has helped launch Al Jazeera America, and has worked with other news organizations like Bloomberg News, NBC, and more. She holds a Masters Degree in International Journalism from Cardiff University and a Bachelors Degree from the University of Pennsylvania. Having lived in Europe for several years, Kristin has experience working in other languages, and on a variety of media platforms. When she's not writing about heroes on Be A Doer, she's traveling the world as a field reporter for Concern Worldwide.